Location: The Morningstar Clan! 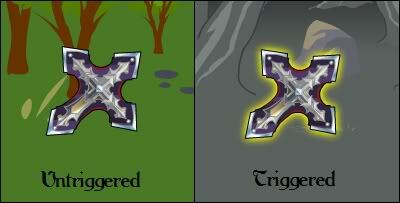 This weapon was also automatically given to players who had Morningstar Boldheart (previously known as Morningstar Crossbow) in their inventory on December 8, 2011. Note: This is treated as a normal Player attack, not a Special. Against monster categories "undead", "zombie" and "demon", the weapon deals 110% damage. Against anything else, the weapon deals 95% damage. If you have the Morningstar Armor and Helm equipped, all attacks with the weapon deal 125% damage. Your enemies will be quite crossed after being hit with this! Click on it to perform a special double-cross attack! The special starts out as a standard bow attack (90% of an average armor attack), which is 414% Base and Random, 802.8% Stats, with +15 BTH. For not having an actual Special attack, it deals *1.02/0.9 damage. Since there are 2 hits, each hit deals 50% damage. The Mastercraft bonus is used to get a built-in skill without a damage penalty. This is a standard skill, and deals 200% damage. Since there are 4 hits, each hit deals 25% damage.